I loved bamboo since I was a child. When the wind blows through them I can hear its beautiful music. I like to see it sway and cast its lace-like shadows in the afternoon. When I had the chance to do my own thing, I started this bamboo garden. Carolina Bamboo Garden’s focal point is the “Bambusetum” – one of the many gene bank conservation areas for various bamboo species in the Philippines. 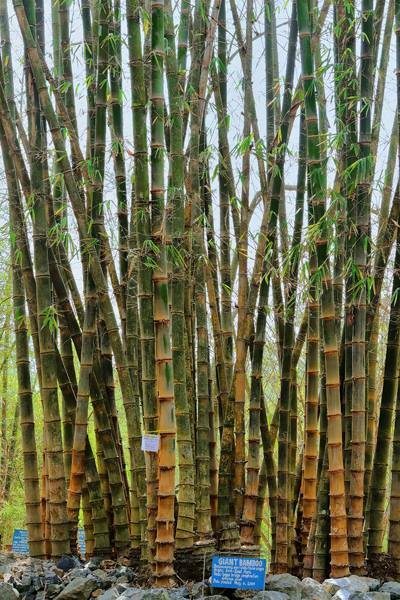 You can find 45 varieties of both indigenous and exotic bamboos here – bamboo plants of many different sizes, colors and uses! 30 of these varieties are available for distribution or to sell to individuals, landscapers, designers and businesses. It grows phenomenally fast and can be harvested without the death of the crop. A sustainable resource of wood for construction and other products – the 21st century timber. With tensile strength greater than that of steel, it can serve construction applications. Its beauty and strength also inspires creative structures never thought possible. From the humble fastfood chopsticks to impressive buildings and bridges, the use for bamboo is limitless. It is also a source of food, medicine, and clothing. The bamboo gives us more benefit than just its uses. It can regenerate degraded soil, clean the air, and release more oxygen into the atmosphere than trees. What was once a degraded hilly grassland overrun by cogon, this piece of land was transformed into an eco-sanctuary teeming with life. Complemented with good planning and design, Carolina Bamboo Garden boasts of its Bambusetum, orchard, and gardens. It is now well forested with improved air quality. The bamboo structures provide the venue for retreats and gatherings while showcasing the beauty and usefulness of bamboo. It has truly become a haven – not just for birds and butterflies, but also for weary souls drained by city living. Know more about Carolina Bamboo Garden through our press features and events. Come to our "LEARN & EARN from Bamboo Experts" Seminar and know more about BAMBOO. Start with the basics and discover its potential! Send us your email for updates or follow our Facebook page. Read more about the event by clicking on the button.